Q. 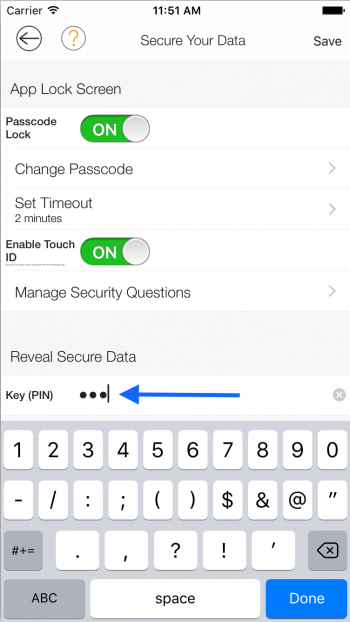 How do I enable passcode lock and PIN? You are here: Home / LifeTopix / Common Questions / Q. 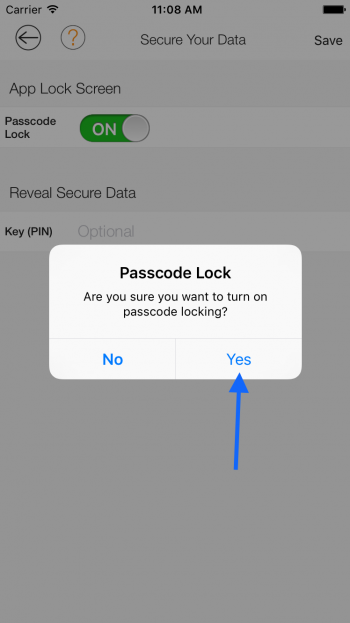 How do I enable passcode lock and PIN? 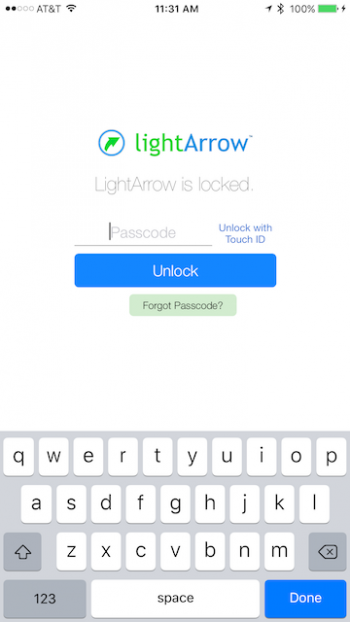 NOTE: This help page applies to both LifeTopix (and other classic LightArrow apps) as well as to LightArrow Organizer for iOS and Mac. 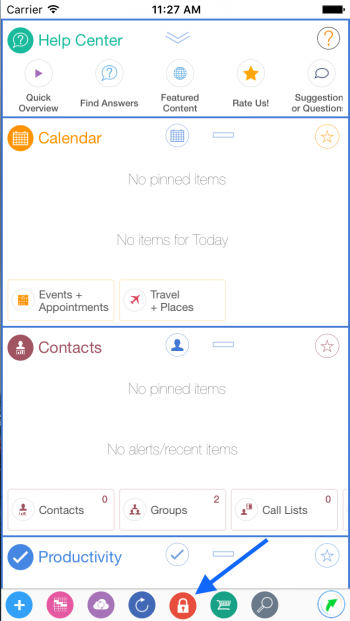 So, the screenshots and directions may vary slightly based on the app you’re using. 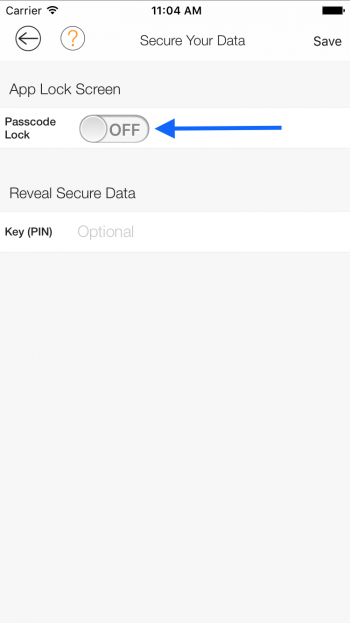 This help page will show you how to set a passcode lock for your app, which provides extra security. 1. To setup the pin tap the “Settings” button on the “Settings” card. 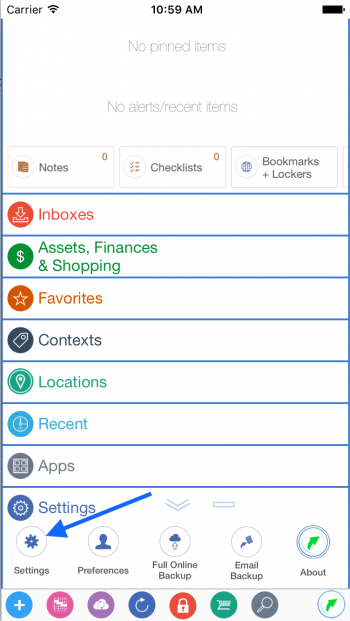 In the next view tap the “Secure Your Data” row. 2. 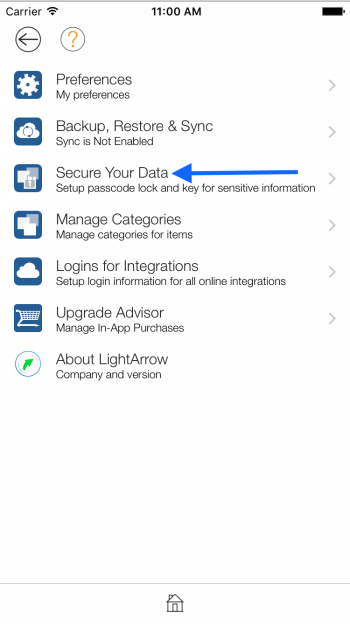 In the “Secure Your Data” view set the “Passcode Lock” to “On”. 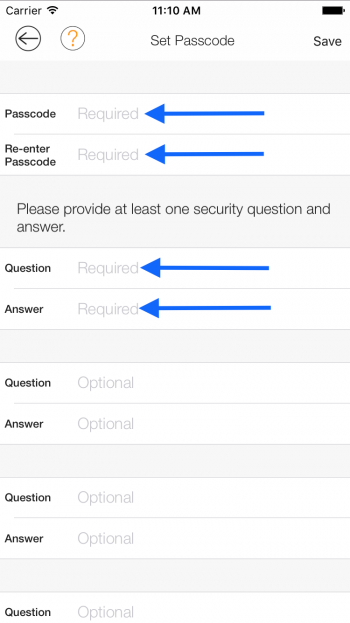 Then in the “Set Passcode” view enter your passcode and at least one security question and answer. Then tap the “Save” button. 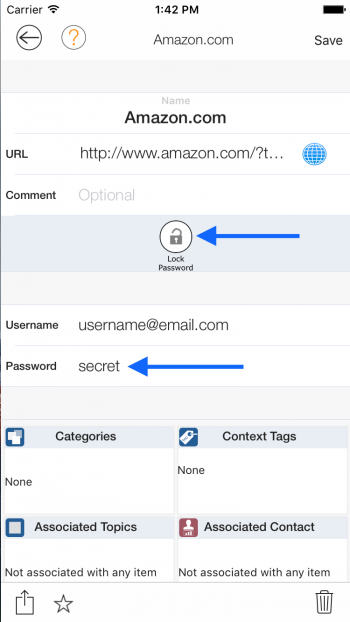 In the “Secure Your Data” view you can also set the timeout, which specifies how long the app will run in the background before the app is locked. 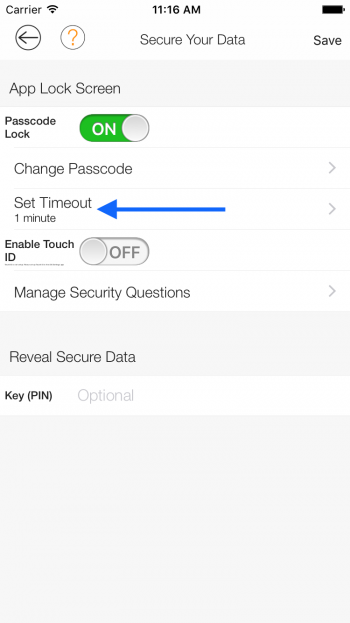 By default the timeout is set to 1 minutes. 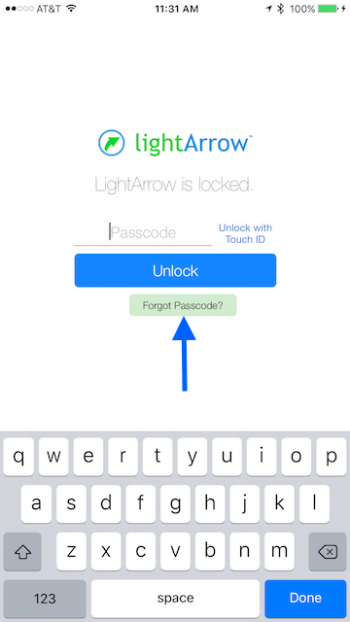 After the “Passcode Lock” is enabled you’ll notice you can now enable “Touch ID”. 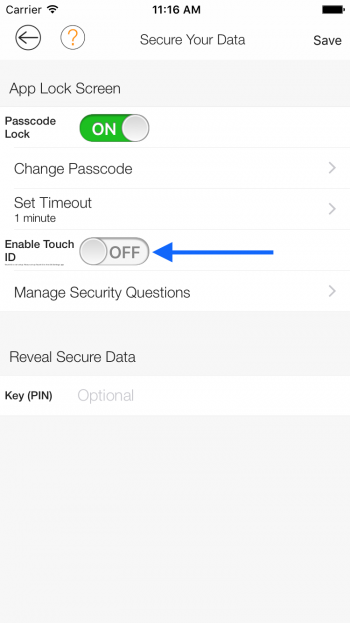 You can enable “Touch ID” by setting the field “Enable Touch ID” to “On”. Then tap the “Save” button. 3. 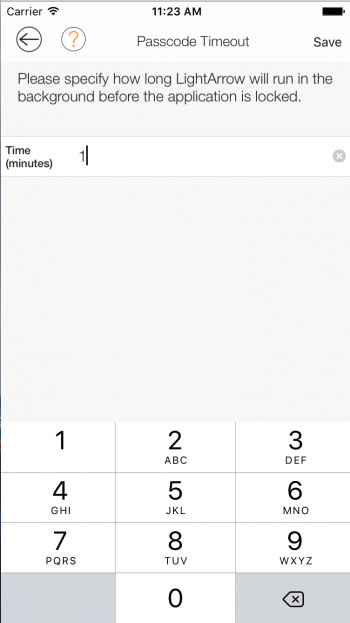 From the dashboard view you can lock the app by tapping the lock button on the bottom toolbar, or when the app first loads you’ll see the lock screen. 4. 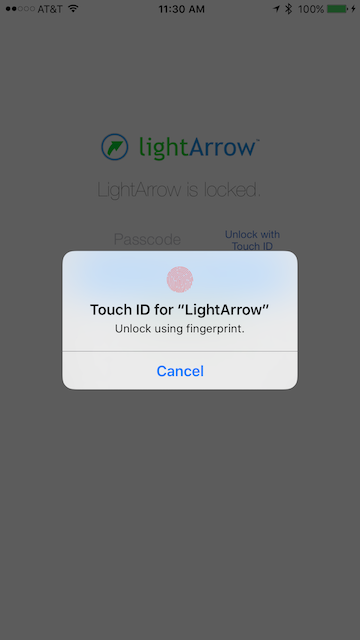 If you have “Touch ID” enabled you’ll be prompted to unlock the app using your fingerprint. If you do not have “Touch ID” enabled or tap cancel when prompted for unlocking with “Touch ID” you can enter your passcode to unlock the app. 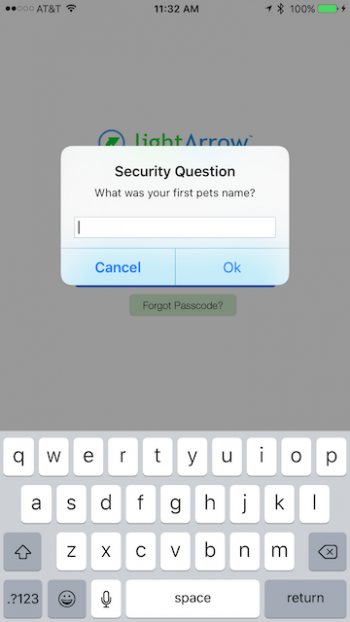 If you have forgotten your passcode if you tap the “Forgot Passcode?” button you’ll be prompted with a Security Question. You must answer at least one question correctly to unlock the App. 5. 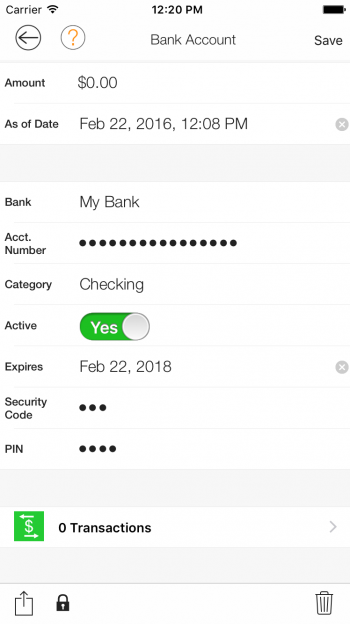 To secure sensitive information for bank accounts and bookmarks you can set your PIN in the “Secure your Data” view. After you enter a PIN tap the “Save” button. 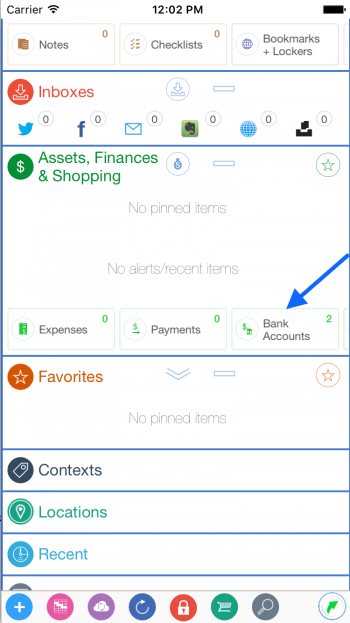 Next, from the dashboard view scroll until you see the “Assets, Finances & Shopping” card and then tap the “Bank Accounts” tile. 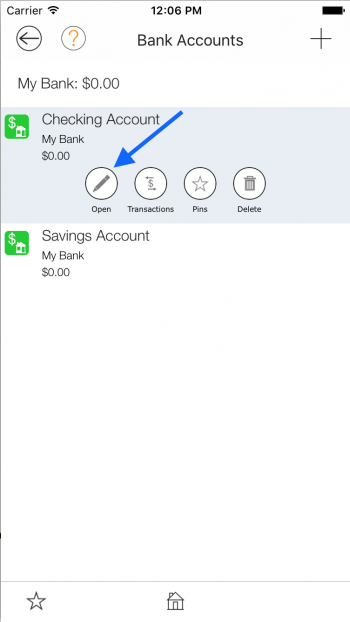 Then from the “Bank Accounts” view tap an account and then tap the “Open” button. 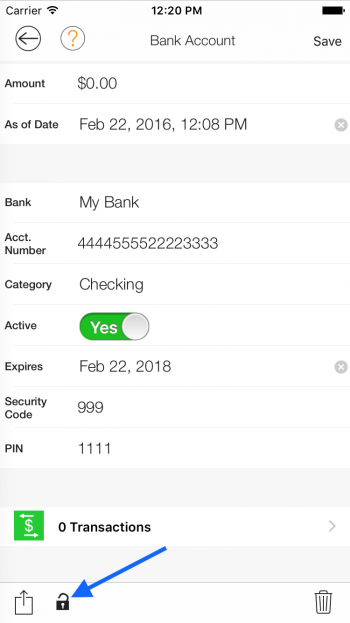 In the “Bank Account” view in the bottom toolbar if you tap the lock button, and then enter the PIN code you’ll be able to see the sensitive data for the fields “Acct. Number”, “Security Code”, and “PIN”. After entering the PIN you can see the data for “Acct. 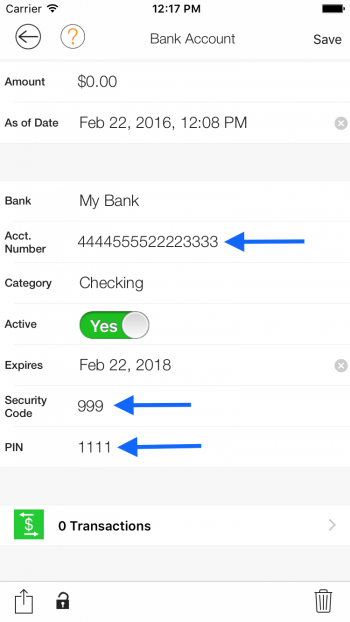 Number”, “Security Code”, and “PIN”. Then to secure the data again tap the lock button again. 6. 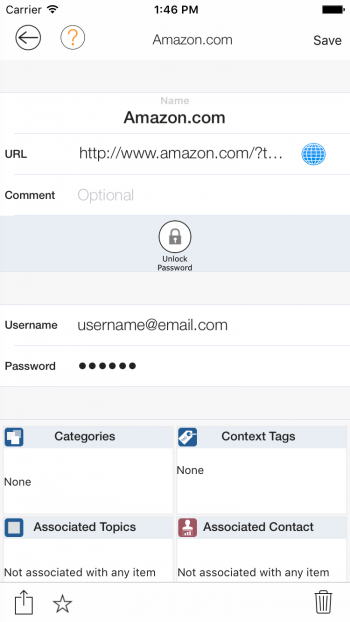 Also, from a bookmark configure view the password is secured. 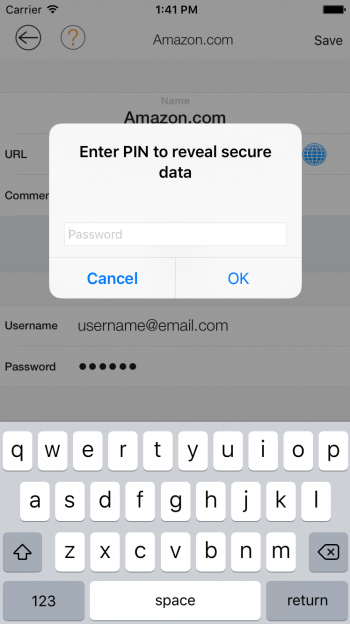 If you tap the “Unlock Password” button, you’ll be prompted to enter your pin. 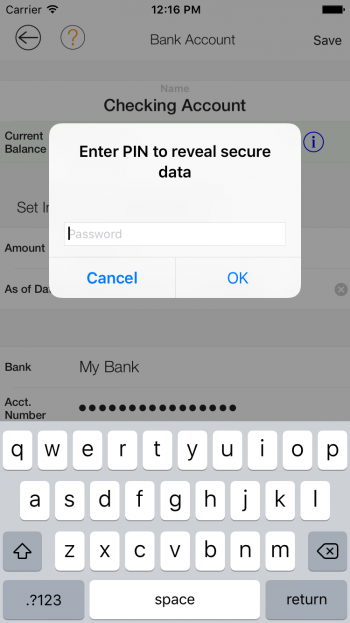 Then after entering your pin you’ll see the password. 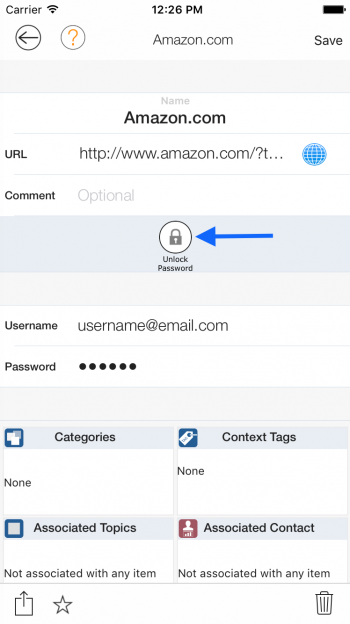 To lock the password again tap the “Lock Password” button.